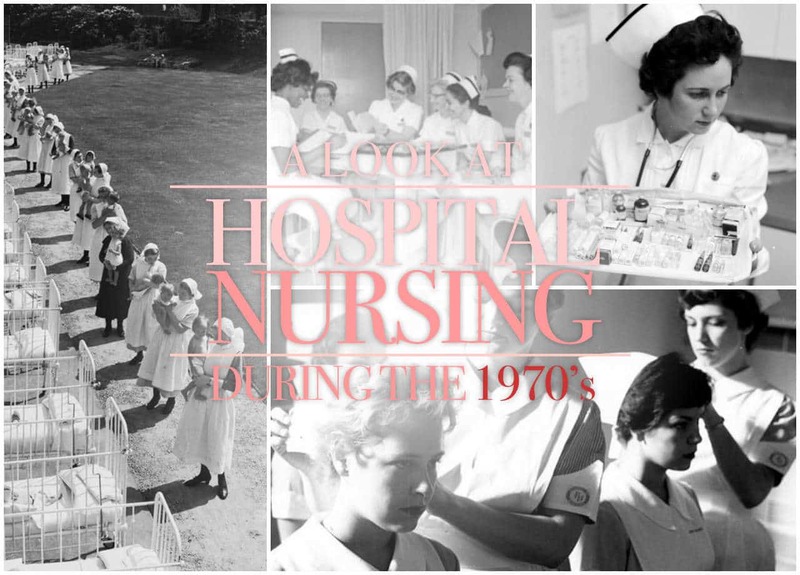 You would feel lost and confused if you were transported back in time to a hospital ward in the 1970’s when the nurses who are now at the end of their careers were students. But you would probably not be as out of your depth as a nurse from that era who suddenly found herself on duty in the present. The world has changed dramatically over the past few decades, and most of the changes are the result of the growth in knowledge and technology. It has been calculated that towards the beginning of the 1900 knowledge was doubling only about every 100 years, after the World War II it was doubling every 25 years, and it is estimated that knowledge currently doubles on average every 13 months. There have also been noticeable social and cultural changes. Generally, life and human interaction have become far less structured and formal, most likely due to the global human rights movement. 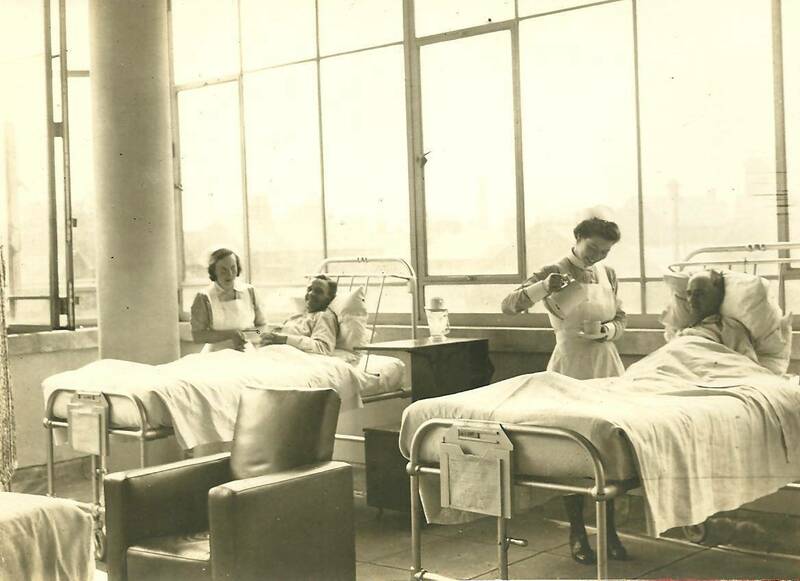 These developments have had a considerable effect on patient care, nursing, and nursing practice, as you will see from the recollections below. 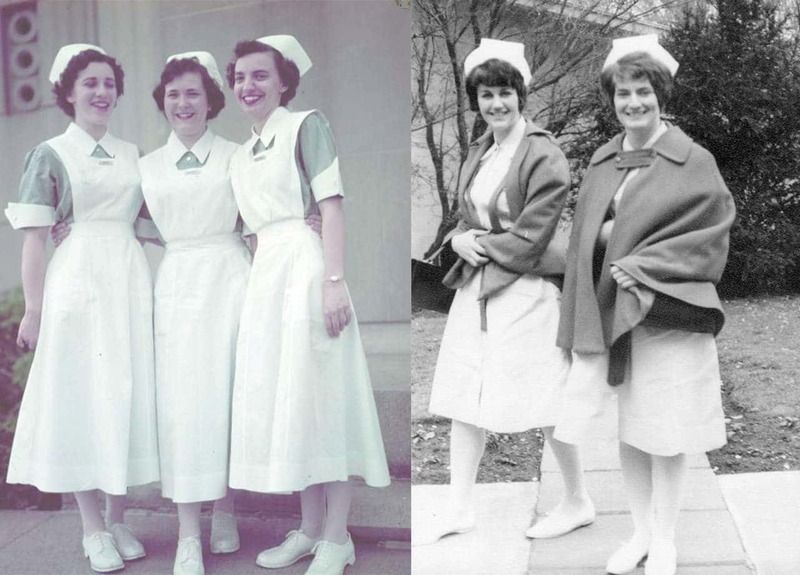 In 1970, I was accepted as a student nurse into the only degree program at the time. Although we were university students, we were on government bursaries (a monthly “salary”) and therefore answerable to the hospital authorities. The day after we reported for our course we went to work in our assigned ward for two weeks until lectures started at the University. 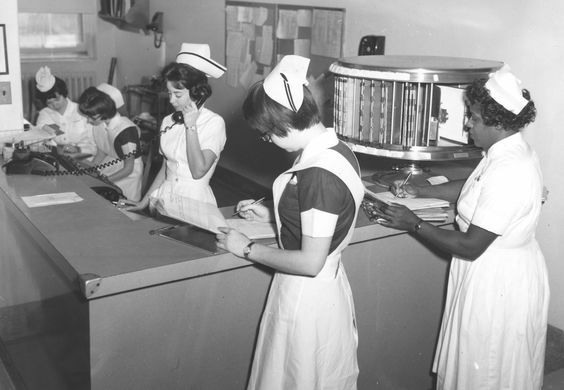 Students were part of the staffing on the wards, and you had to learn on the go and quickly. 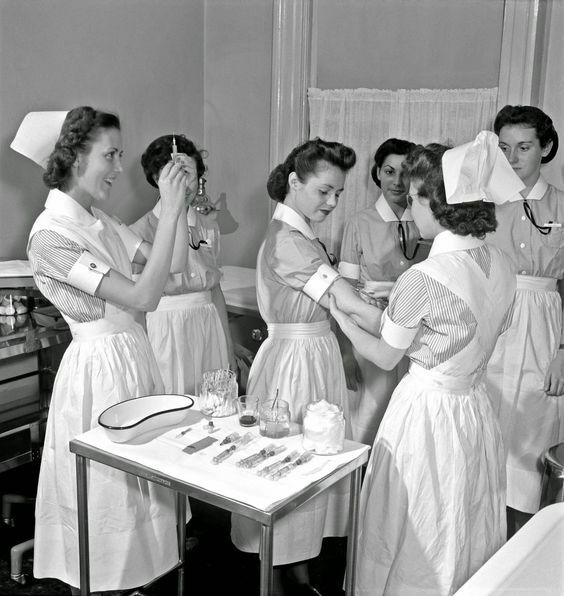 A group of nursing students during hands-on training. Image via: Pinterest. As first year students, we worked five hours per week during term time and a full 45 hours during university holidays except for the regular leave of 30 days a year. Work during term time increased to 20 hours per week in our second and third years (most of it during weekends), and to 40 hours in our fourth year. This while we still had to attend the reasonable number of lectures and study for tests and exams. 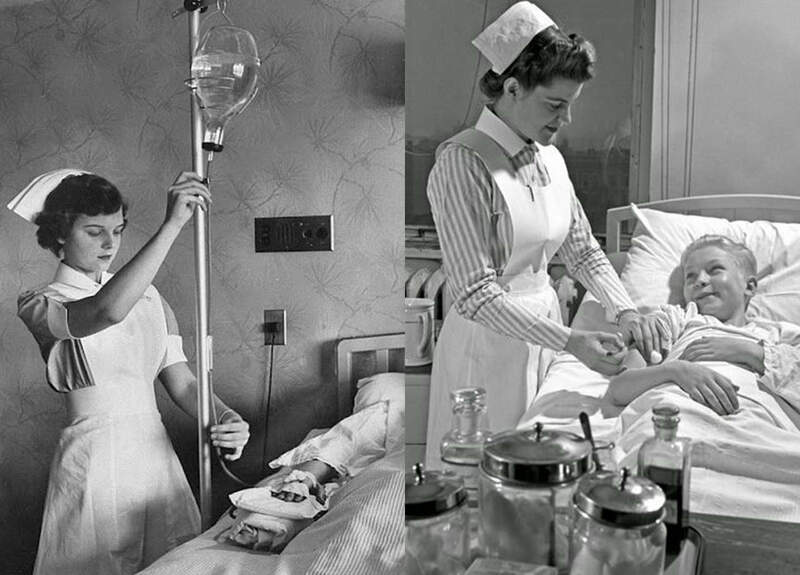 Registration as a nurse required a certain number of night shift hours, so much of the time during University holidays were spent on night duty. We had to live in the nurses’ residence during our first year. On weekdays, you had to sign in by 19:00 and weekends by 23:00 unless you had obtained a special dispensation from the matron of the hospital. You had to report for duty at least 15 minutes early for the handover report for all the patients on the unit. You were also expected to know the names and conditions of all 30 or more patients. Great respect towards seniors was demanded– the sister-in-charge of the ward, the doctors and especially the matrons were revered. 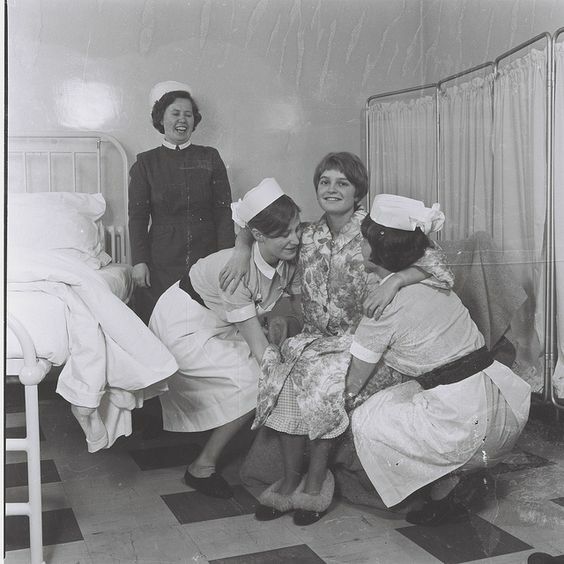 It was etiquette to allow superiors to go through a door first, and you could often find a group of nursing students forming a “guard of honor” at a doorway while the matron was still 20 or more paces away. 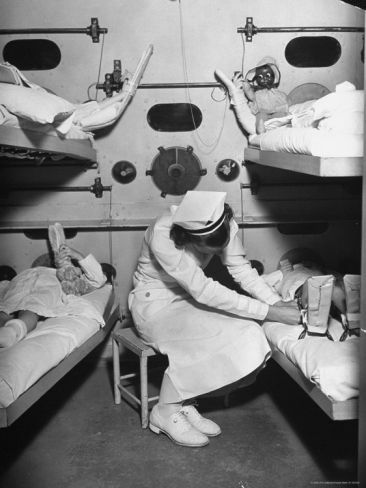 Neatness of the nurse herself, as well as the wards, was a priority. Before visiting hours all the bed linen had to be straightened, with perfect hospital corners, the overbed tables had to be in straight line at the bottom of the beds with all the wheels pointing in the same direction. Fortunately, most patients were understanding and endured the trussed up state until the doors were opened for the visitors. We collected our uniforms on induction day – the first of the seven starched white blocks received weekly. There was also a cap in its flat state, a short and a long cape. When we arrived at the nurses’ residence the first order of the day was to learn, under the supervision of the final year students, how to iron the starched block into a wearable dress. The uniform was the double-breasted type, cinched at the waist with a belt. We also had to learn how to fold and pin the caps into what looked like upside-down ice cream tubs and how to fasten them to our hair with clips so that they remained firmly perched in place all day. 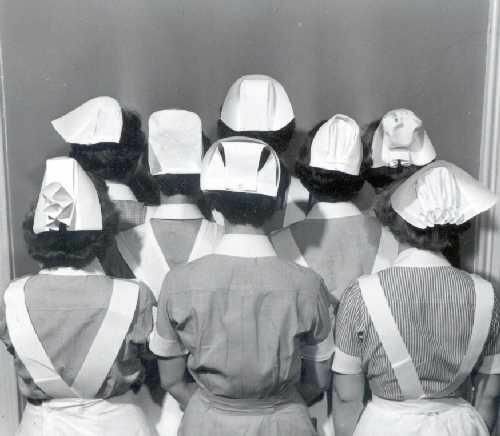 Different styles of nursing caps. Image via: Pinterest. Fortunately, there was a uniform policy change during our second year when we were given a uniform allowance and to buy our own wash-and-wear type uniforms. The “mini” was in fashion then, and of course, we all tried to get away with wearing our dresses as short as possible without getting into trouble. Nursing duties were allocated according to tasks rather than assignment to particular patients. Junior students did the basic nursing duties, such as “beds and backs” or checking all the patients’ vital signs. As you progressed, you do more advanced procedures and tasks. A final year student could at times take charge of a unit if there was no registered nurse (sister) on duty. The food was not portion packed, except for special diets. It was delivered in a large trolley and the nurse in charge dished up for each patient. Other nurses would collect the plates, hand it out to the patients and then assist those who needed feeding. Similarly, patient’s medicines were not dispensed individually by the pharmacy. 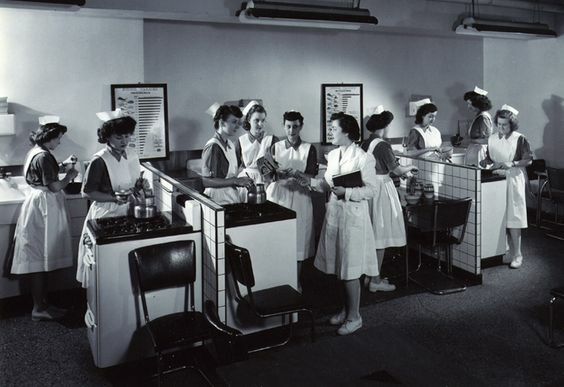 There was a trolley with the full range of tablets and from here, using a using a card system to which the individual patient’s prescriptions had been transcribed, a senior nurse would hand out the medicines. Considering this system, it was surprising that very few medication errors occurred. There were no computers and no electronic records. Everything was written by hand. The patient’s file was not kept at the bedside but, usually, in a room just beyond the ward office. It contained the admission records, doctor’s notes, prescriptions and diagnostic reports. There was also a vital signs chart on which the nurse responsible for taking the vital signs of all the patients had to chart them in graph format. Recoding vital signs required the use of three-colored pen to reflect the three different shifts. . The nursing process and nursing care plan were only introduced widely towards the late 1980’s although this does not mean that there was no planning of nursing care. There was a metal flip folder, with a card for each patient from which the report was handed over to the next shift. Throughout the day any abnormal observations, changes in the patient’s condition and treatment orders would be entered on this card. The nurse in charge would enter specific nursing instructions, conveyed during handing over. Her planning of care was also reflected in the allocation of duties at the start of each shift. “Beds and backs,” a routine done three times a day, fell into disuse mainly because of early mobilization and shorter patient stays. Usually, in teams of two, nurses went to each patient, in turn, seeing to patient comfort, making general observations and taking action to prevent pressure sores. Bedridden patient’s backs, hips, heels, and elbows were rubbed and creases and crumbs removed from the linen. Pillows were plumped up, water jugs filled, and the general surrounds tidied. 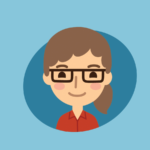 Patient requests would be attended to, and anything unusual in the patient’s condition would be reported to the nurse in charge. There was less focus on infection control then, and you didn’t wash your hands between each patient! Very little technology was in place to assist in monitoring patients. The temperature was taken with a mercury thermometer, you wore a pin watch for counting the patient’s pulse and respiration, and BP was measured with an aneroid sphygmomanometer. In general wards, each bed did not have an oxygen supply – you wheeled in a portable oxygen cylinder when a patient needed it. Intravenous fluids came in glass bottles and if you needed to control the speed of administration you either counted the drops per minute, or you stuck on a length of tape on which you marked the minutes or hours. Very few intensive care beds were available in the hospital. Most of the ICU’s were converted side rooms of specialist units with two to four beds. For example, the nephrology unit had a two-bed ICU section for kidney transplant patients. A cardiac monitor, a respirator, and a central venous pressure line were generally the only advanced equipment used in these units. There were no intermediate high care units. Critically ill patients were mostly treated inside rooms on the wards where a form of patient allocation was used when one of the nurses on the staff complement of the unit was allocated to “special” one or two patients. 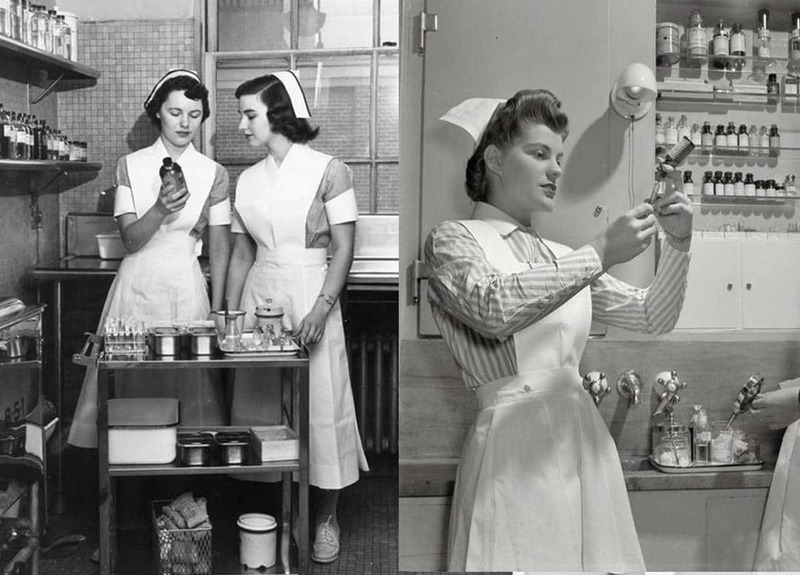 Nursing has changed dramatically over the past few decades and will probably change as much or more over the next forty years, and this is why continuing education has become so important. While developments in society, medicine and technology will change the landscape, it could never replace the essence of nursing – caring for other human beings at a time of need. What a trip down memory lane! Although, Nursing Process and Nursing Care Plans were a big part of nursing education in the mid to late 1970’s, in my experience.